General source for software is AfterDawn.com. You can also find there nice guides. Check CCExtractor - small program that processes MPEG 2 files and extracts closed captions data to generate subtitle files. How to watch video with subtitles? Synchronizing a subtitle file with your movie is in fact a really simple task. You only need a single program called Time Adjuster. At the time of writing this tutorial, the latest version (3.1) can be found here.Once you have installed Time Adjuster, just launch it and open your subtitle file in the program. If everything is OK, you should see the subtitle file in Time Adjuster's window. Open your movie file with your preferred multimedia program (I would of course recommend VLC, THE open source media player...) and browse until the first line of your subtitle is spoken. Note the time (hours, minutes and seconds). Now go back to Time Adjuster, and click on the stopwatch icon (6th from the left in the icon bar). A window opens, divided in two horizontal parts (the upper part is for the beginning of the subtitle file, and the lower part for the end of the subtitle). On the upper right, you will see two tabs, called "DDS" and "hh:mm:ss". Select the "hh:mm:ss" tab and enter the time that you have remembered for the first line of the subtitle (of course you can select another line, if it is easier for you). Do exactly the same for the last line of your subtitle (of course something that is spoken, not the name of the person that created the subtitle), note the time, and type it in the lower "hh:mm:ss" tab. Once you have done it, just click on the OK button, and a second window is opened with your new subtitle file. A little "File" -> "Save As...", and you've got your new subtitle, perfectly synchronized with your movie file! And don't forget, use SubDownloader to upload the subtitle file, so that other people with the same movie file will be able to download "your" subtitle that goes so perfectly with your movie file! You can also do other things with Time Adjuster, such as splitting or joining subtitles. If you are interested in such things, you should definitely check it out! How to add subtitles to your DVD? 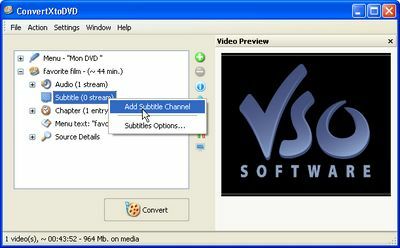 How to add subtitles to your DVD? how to add .SRT subtitles to your divx, avi, xvid, mov, wav, mpg, etc file to then convert and burn to DVD. First step is to go to VSO software webpage and download and install the latest version of ConvertXtoDVD. Now click on the “+” sign next to your film, and you will see a sub-section titled ‘Subtitles’. This sub-section indicates the number of subtitles streams associated with the video file added. If there are any subtitles streams they will appear listed below. Now find your subtitle file on your computer and put it in the same folder that your video file is in, and give it the exact same name keeping only the extension. Add the video file again to ConvertXtoDVD and you will now see your subtitle stream as done in Figure 1. If you would like to select the subtitle you would like to show up by default when you play your DVD, simply right click on the subtitle file you have added and select “Set as default subtitle”. Notice that now your subtitle file will have little * to next to it, signifying default subtitle. If you do not want this subtitle to be the default subtitle right click again and uncheck “Set as default subtitle” by clicking on the check mark; notice the * disappear. Check to see under the “Settings” tab that all is as you wish, and then hit convert. A couple of minutes or hours later depending on the size of your video and Voila you are all done!